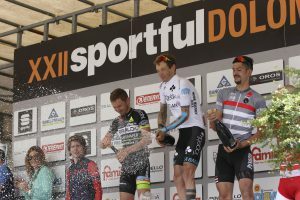 The Tuscan Stefano Cecchini (La Bagarre) won the 22nd Sportful Dolomiti Race, taking victory for the second year in a row in the 204 km event with nearly 5,000 m of elevation gain. The weather did not allow him to set a new record, but he stopped the clock at 6h31’54” after a hard-fought finale with Enrico Zen (Team Beraldo), who caught him on the descent after the last climb, Passo Croce d’Aune. He earned the victory in the last 450 m up Via Mezzaterra on the way to the finish line in Piazza Maggiore. 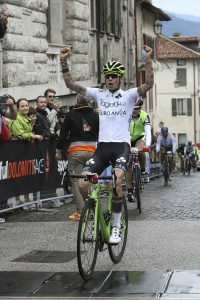 Third was former pro Mauro Facci (recent winner of several other granfondos), at 2’31” behind the winning time. 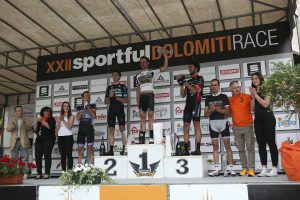 The best rider from Belluno province was Nicola Cassol (representing race organizers Pedale Feltrino), who finished seventh overall with a time of 6h43’30”. Among the women, Simona Parente (Somec-Mg K Vis) took the victory by a significant margin (28′), in a time of 7h18’22”, in front of her teammate Odette Bertolin (7h46′) and Maria Cristina Prati (Team del Capitano) in 7h57’28”. 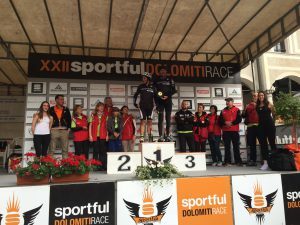 In the MEDIO ROUTE (133 km and 3,050 m of elevation gain), Luigi Salimbeni (Ciclo Team San Ginese) finally took the win after a series of second places, beating Fabio Cini (Genetik Cycling) in the sprint in 4h04’59”. Third, just behind them, was Matteo Cipriani (Inifinity Cycling Club), winner of the 2015 edition. 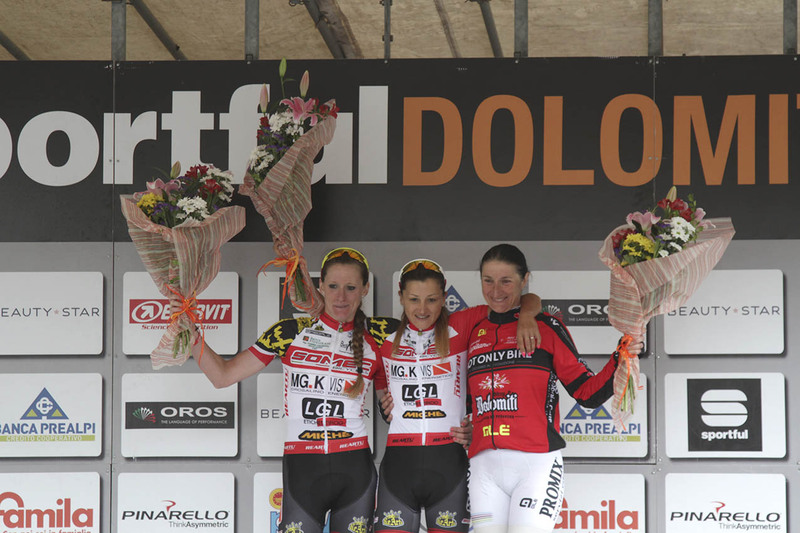 Among the women in the Medio route, Barbara Lancioni (who has won three past editions of the Sportful Dolomiti Race, but the long route), took the solo victory in 4h28’26”, ahead of Astrid Schartmuller (Alpilatte) in 4h35’47” and Marica Tassinari (Passion Faentina) in 4h41’10”. As per tradition, the majority of riders tackled the Gran Fondo route, despite its difficulty, knowing that they will be able to take home a memory of a great accomplishment. Only 72 women rode the long route, which included the climbs of Cima Campo, Passo Manghen, Passo Rolle and Passo Croce d’Aune. 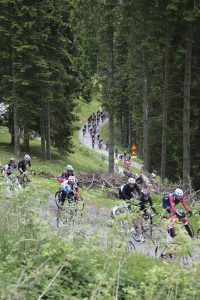 No major problems were created by the three-hour traffic closure on Passo Rolle, which allowed more than half the cyclists who chose the long route to ride in complete safety. And this is also reflected in the number and severity of cases seen by the medical assistance service, which was not called into action other than for some minor crashes by individual riders. Nothing like the accidents caused by motorcyclists in the 2015 edition, which saw five blameless riders sent to the hospital in serious condition. The two-hour closures on the Manghen, Broccon and Gobbera passes and six hours on the last climb to Croce d’Aune have now been tested. “Our ultimate dream would be to have total closure for the entire event to ensure the safety of all 4,650 participants,” said Ivan Piol, president of the organizing committee supported by Pedale Feltrino. “We know it is a utopia, but we will try just the same. The Maratona dles Dolomites is already doing it. We have the Dolomites too, and this year a lot of communication work was done together with the Primiero tourist association and the police of the Primiero valleys and the Rolle area. The results were clear, and we thank everyone, including the Province of Trento, for the great collaboration. The inconveniences were limited. 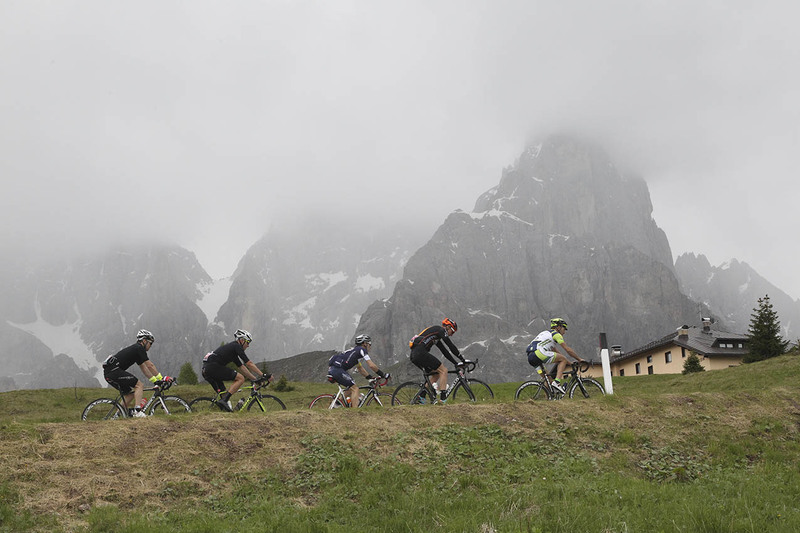 Our goal is to become the alternative to the Maratona dles Dolomites in Corvara. We have the Dolomites ourselves, and the route we follow is absolutely fantastic, as the numbers that we’ve achieved show. There was a great show on the long route, thanks to the Olympic champions who participated in the Olympic Relay, a new formula involving athletes who have won Olympic gold medals in various disciplines. This year there were eight athletes, divided into two teams, with each athlete climbing one pass. 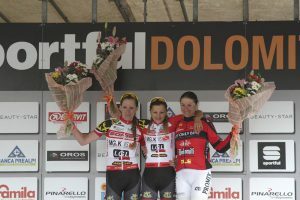 Gabriella Paruzzi and Antonio Rossi rode Cima Campo, Christian Zorzi and Pietro Piller Cottrer challenged each other on Passo Maghen, Rossano Galtarossa and Jury Chechi tackled Passo Rolle, and then in the final battle Silvio Fauner had to yield first on the descent off Passo Croce d’Aune, where the “cricket” Paolo Bettini showed his class in descending despite the rain, and then sprinting across the finish line in Piazza Maggiore in front of Pietro Piller Cottrer, Fauner’s teammate. The blue team won, taking home the crystal trophy created by the master from Treviso, Marco Varisco. It was a granfondo that attracted riders from many countries, including Enrique Torres from Cuba, a group of Brazilian cyclists from Rio di Janeiro who followed the actor Rodrigo Hellnet, the Spanish friends of Underbike from Barcelona, and the German journalists from Tour Magazine who followed the event by bike (on both routes) and by motorcycle, to mention just a few of the 500 foreigners who joined the cycling party that started at 7 a.m. in Feltre and finished at 7:30 p.m. with the black jersey, the last rider to cross the finish line. They arrived four minutes before the cutoff: the black jerseys are Carmelo De Mariano from Milan and Giorgio Foschini from Faenza.